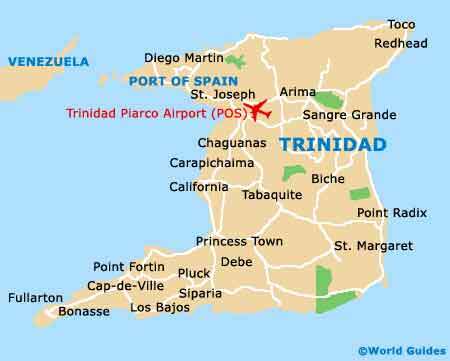 The main gateway to the island is the Trinidad Piarco International Airport. It is found just 30 minutes' drive outside the main city on the island, Port of Spain. The airport, which is among the Caribbean's most important air links, is one of two international gateways into the Republic of Trinidad and Tobago. Over the course of a year, more than 2.5 million passengers use Trinidad's airport. One runway, which stands at more than 3,200 metres / 10,500 feet in length, operates in conjunction with two helipads. The facility first opened in the early 1930s and has undergone considerable refurbishments over the last two decades. Today, two terminals are in operation. Caribbean Airlines offers the most flights. This commercial airline flies to several destinations throughout the Caribbean, including Barbados, Antigua, Kingston and Grenada. International flights are also served by other airlines such as United Airlines, American Airlines and British Airways. Located close to Kelly Village, the Trinidad Piarco International Airport is located 27 km / 17 miles from the capital, Port of Spain. Just 6 km / 3 miles to the north-east is the region of Arima, while the large city of San Fernando is situated some 47 km / 30 miles south of the airport. By car, travellers can reach most areas of Trinidad with ease. Therefore, driving to and from the airport is a fantastic option for passengers. Motorists coming from the airport and headed for Port of Spain can take the Churchill Roosevelt Highway westbound, which becomes the Beetham Highway and then Wrightston Road. From here, drivers should follow the well-posted signs to the centre of the Port of Spain. The journey time is around 30 minutes. Book your Piarco Car Rental here. There are buses available from the airport, offering cheap access to the capital, Port of Spain, and other popular locations. By bus, it usually takes about 45 minutes to reach the centre of the capital. Taxis are available outside the North Terminal's Arrivals exit. Airport staff provide assistance at the taxi rank, from where taxis travel to any part of the island of Trinidad. Make sure the taxi driver uses a meter prior to leaving the terminal, as this will eliminate the need for fare negotiations. All taxi license plates start with 'H'. Therefore, passengers should not hire the services of drivers in vehicles with plates that don't start with 'H'.